Why Some of Us Will Not, Cannot, and Do Not Post about Baltimore - Select. The events unfolding in Baltimore at the moment are depressingly familiar: Police officer uses excessive force and kills an unarmed Black person. 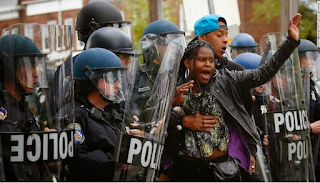 Black people take peacefully to the streets to express their despair and desire for change. The police escalate the situation. Violence erupts. The media and individuals online express their disgust at the Black protesters. Black people take to social media to report the actual facts as they happen and their personal responses and pain. Rinse and repeat. Another dead body. Another wave of misinformed and racially biased coverage. Another swell of grief. It never ends. In today’s world, when anything of note happens, the place to discuss it is social media. There is a hashtag, a trending topic, a status to be made and shared. The importance of these platforms in situations of civilians versus the state is not to be underestimated. The ability to share information accurately from the frontline, without the filter imposed by authorities is one of the only ways we have to discern the truth. However the ubiquity and constant nature of social media means that it is quite frankly exhausting. It is draining and demoralizing to scroll through reams and reams of the hurt done to our communities by white people, as well as to see the reactions of other white people to this state-sanctioned violence. But many Black people feel that they have a duty to keep posting and to keep engaging and to keep pushing past the deep pit of sickening hopelessness that opens up any time we are reminded that in the eyes of so many, a broken CVS window is worth more sadness and outrage than the broken spine of a young, Black man. Some Black folks, however, keep quiet on social media, even when situations reach their peak. This is not a sign of apathy or disinterest. It is not because we just don’t care. It is not complicit silence. It is because we are close to our breaking point. The mental toll of posting about state-sanctioned violence against people of color is monumental. It doesn’t seem to matter how many people peacefully protest online or scream and shout their throats raw in the streets crying for justice, the status quo just keeps rolling. Audre Lorde told us, “Your silence will not protect you.” But neither, it seems, do our voices. On social media we can see smart, passionate Black people like Jesse Williams destroying racist logic and skewed “facts.” We can see that we are on the side of what is right and what is true... and then we can get engaged in an argument with our racist step-cousin on Facebook and realize that some people don’t care about justice or Black people’s humanity, and it all comes crashing down. It is because we just don’t have the words. How many times can you shout your pain into the abyss of the Internet? How many times can you exclaim that you “can’t believe” what’s happening? How can we possibly have the words to explain in 140 characters the combination of helplessness, hopelessness, frustration, distress, desperation, and anger that is seeping out of us? Words on a screen can’t convey what it's like. So we take our emotions inwards and we sob it out under our blankets and then we carry on. Pain isn’t meant to be a performative emotion. Just because we are not broadcasting it to the world doesn’t mean it’s not there. It is because it makes us feel more helpless, to sit in front of a screen and cry whilst typing out our fury and our fear and to be aware of just how many other Black people feel exactly the same. Talking on social media to other people about how you’re all as scared as each other isn’t comforting. It isn’t soothing to log on and be faced with the visceral emotions of a community living in terror and anguish. At least off-line we can pretend, for a few hours, that it is just us with a sick ache at the back of our throat, that this isn’t reality for us all. It is because once you’ve put the words out there, everyone and their mother wants to discuss it. They want to have a “calm, rational debate,” but all you can do is curse because where is there room for debate? What is there to argue? Racism is alive and well while more and more Black people are not. The end. They want to tell you that, “Not ALL cops…” They want to tell you you’re being unfair to white people. They want to talk about some sanitized MLK quote. They want to roll out their “Black on Black crime” defense. They want to call innocent teenage boys “thugs” who “deserved it.” They want to ignore your pain and the pain of countless Black people so they can assert their white-centered view of the world, in which Black people just aren’t trying hard enough to not get murdered in cold-blood. It is because we choose to discuss these things with the ones we love, in places offline where we feel safe. We choose to talk about them only with other Black people who will not badger us for “links” and “proof” and expect us to spend the little energy we have on educating people on hundreds of years of racial oppression, so that they can see what’s happening in Baltimore didn’t develop overnight. We make the choice to not engage with the circus of social media and its cruelties and its potential for opening us up to abuse. We make the choice to share our despair in person, so that we can hold each other and assure each other. It is because we are protecting ourselves. It takes strength to get out of bed each day as a Black person, knowing that you are one trigger-happy cop away from your name becoming a hashtag. It takes hope to keep going. Supplies of hope are in short supply when there is another name added to the ever growing list of the dead, when you’re still despairingly posting about the last victim of this senseless epidemic of violence. Freddie Gray’s body was barely cold in the ground before Terrence Kellum had been shot ten times, in front of his father, in his own home. Sometimes in order to do what we need to do to live and thrive and flourish, we have to take a step back from reality. Disengaging with the horrific patterns of society is a coping mechanism. There is only so much one can say about the perpetual violence done to us before it bores a hole that is never allowed time to heal. Photo: Drew Angerer / Getty Images Kesiena Boom is a Black lesbian feminist and writer who adores Audre Lorde, sisterhood, and the sociology of sexuality. She is twenty years old. She is a regular contributor at For Harriet and has also written for Autostraddle.com. You can tweet at her via @KesienaBoom.